Oh, my. It's 86 degrees here in San Francisco. It's too hot! How did I ever live in Chicago? 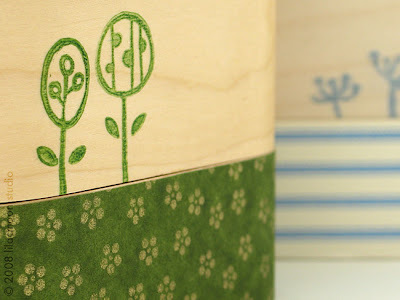 Anyway, it's time for another quick rubber stamp project! Couple days ago, I stamped on wood for the first time. 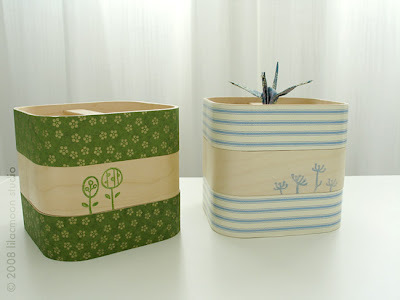 These are little 3-tier storage boxes bought from Ikea very long ago (here). I've decorated them before but it was time to update them. 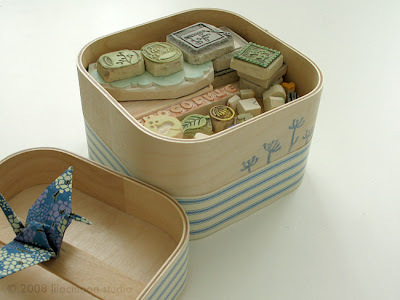 Again, it was very simple to do, with strips of patterned papers, tape, and stamps I had already carved. The inks took awhile to dry but I think I'm happy with how they look on wood. Cool! Next time I go shopping for craft supplies, I'll be on the lookout for wood things. I love all your stamps! They look so good stored all together like that. Oh hang on! Yes you can! Woot! I love wood. You probably already have your mind set on which inks you like to use, but when I'm stamping on wood I usually use StazOn ink. It dries quite quickly and won't smear if you happen to get it wet. what would we do without ikea.. woot! thanks for the suggestion on the ink. i used Fabrico and VersaCraft and was wondering if StazOn would work better. i'll have to get some of them now. ;) thanks! It IS hot here!! Hot and wonderful! These boxes look beautiful. It's such a lovely touch. These look fun, and I think you have a very fresh looking blog-I love it! Thanks! I hope you all have a great weekend! love that cute little box full of stamp goodies! Hi Jinnie, I noticed that I need to ask permission before using a picture link back to your blog but I can't seem to find your email anywhere! If it's staring me right in the face you'll have to excuse me! I've been known to do that! Anyway, I would love to link to your Poloroid wall if you don't mind! wooahhh! I love your stamps!!! and i especially love your polaroids!!! I have just discovered your gorgeous blog thanks to a link from One Pretty Thing...and I'm very glad that I did! I hope you don't mind but I've added you to my blogroll so that I can come back and visit regularly. It's funny, I saw the close up picture on your Flickr stream and liked it, but I didn't realize that it was part of this whole awesome box project. Seriously wonderful. I may have to do these for Christmas presents. Really, really love it.